The idea of blowing glass into a decorated mold originated around A.D. 45, copying the decorative motifs then in vogue among Roman bronze and pottery vessels. Interest in this glassworking method declined late in the 1st century A.D., however, as various ways of creating crisp geometric designs were developed using simple abrasive tools and a lathe. 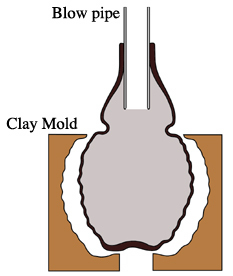 For reasons unknown, there was minor revival of mold-blowing in the eastern provinces during the 3rd century A.D., a grape cluster becoming a popular body shape for bottles and jugs. The vessel displayed here is a rather careless product of those times. The two halves of its mold were so poorly aligned that hot glass seeped deeply into the gaps between them, thereby disturbing the rhythm of the decoration. Later on, while the rim was being shaped, the glass was too hot and therefore too soft, so the whole vessel became lopsided. Fleming, S.J., 1999: Roman Glass: Reflections on Cultural Change, 37-42, 58-66, and plate 83 (Philadelphia: University of Pennsylvania Museum). Israeli, Y., 1983: “Ennion in Jerusalem,” Journal of Glass Studies 25, 65-69. 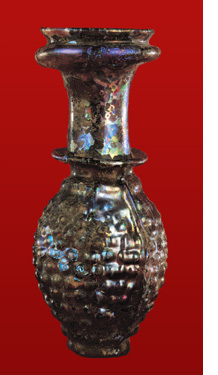 Stern, E.M., 1995: Roman Mold-Blown Glass, 74-86 and 114-117 (Rome: "L'Erma" di Bretscneider).